I've seen the sun exactly twice in the past two weeks. And briefly at that. I feel it's safe to say that most residents of the East Coast are already tired of winter, which is pretty disheartening considering the solstice isn't even for another 10 days. Conversation among my fellow stay-at-home moms has revolved around how we're trying to soak in as much of the Christmas spirit with its cheery lights and cozy smells before we hit the post-Holiday season suckfest that is the remainder of winter. I was amused to find out today that general annoyance about the frigid, overcast days has reached my Syracuse relatives. My overall impression of the 'Cuse was that residents spend September to April buried under (roughly) 80 feet of snow, and, just like the Eskimos they're born with certain Polar skills. They know how to navigate treacherous terrain, just like the ice road truckers, straight out of the womb. They have more than 100 different words in their vocabulary for the word "grey" because that describes the sky 98 percent of the year. They're the Frank Lloyd Wrights of innovative snow construction. 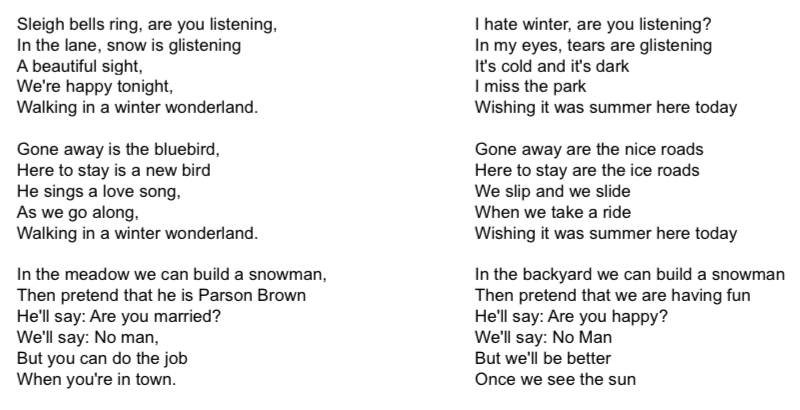 "So yesterday Maureen and I were texting and she was talking about the bad weather in Syracuse so I suggested she write a poem or compose a song that would make us all laugh and smile-- here is her creation for your Thursday afternoon entertainment." It seems cruel, really, that anyone living in the tundra of Upstate New York would dislike their cloudy climes. I love mom's challenge to write your way out of the winter blues and Aunt Mo's willingness to play along with her special brand of wit. And, on a slightly unrelated note, Aunt Maureen doesn't know this, but one of the main characters (oh how I love this character) in my novel is named for her, so it seemed strangely fitting that her creative spirit wafted south today on an Arctic breeze. And in case you're wondering about that black hole of a project, my assignment this week is to write a synopsis of the novel and a query letter (thanks Beth). I'll make sure to post what I come up with soon ... cuz many of you have asked what it's about and I haven't had a succinct answer.